We just launched a new way for users to see the tweets for their research output, also known as artifacts. This new view is accessible directly from a PlumXTM artifact page and shows all tweets that are publicly accessible in reverse chronological order. With this new feature, it will be easier for researchers, and the people who support them, to have a one-stop place to understand the impact and conversations about their research happening through Twitter. Seeing the tweets in context is a great way to see communication about a topic or article unfold over time. 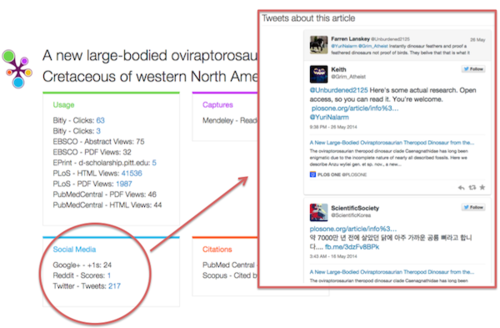 For example, the tweets about the discovery of a large-bodied oviraptorosaurian stretched from March to May. And this article on the origin of microbodies in fossil feathers shows the tweets and images they contain from March to September 2014. PlumX indicates the total count of all tweets and retweets (from Sept 1, 2012 and ongoing) on the artifact page. The tweet page then displays all of the original tweets about the article. In some cases, there may be tweets that are available only to a Twitter user’s followers. In those cases, we include the tweets in the count, but don’t show them on the PlumX tweet page. To request more information about Plum Analytics go here.